We’re very excited to announce a new partnership with Swarmbustin’ Honey They’re located in West Grove, PA, and the founder Mr. Walt has been perfecting the Apiary Arts for over 35 years. 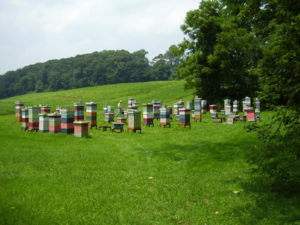 They raise their own well fed good looking Keystone State bees, and produce their own un-heated, un-filtered honey. A full line of products is available from their online store. They also agree with ForestPlanet that trees planted anywhere help everyone everywhere, even the bees. That’s why all visitors to the Swarmbustin’ store can choose to “plant a tree with that?” with each order. By doing so they are helping to couple tree planting with consumer activity, and at a very low cost. If trees are planted in conjunction with each shipment, then it’s likely that the transaction is “carbon negative”, i.e. the carbon offset of the trees is probably much higher than the carbon footprint of producing and delivering the honey. Being carbon neutral isn’t enough anymore, we all need to Go Negative! Right now ForestPlanet is supporting the replanting of many millions of mangrove trees in Madagascar, and as it happens honey made from mangrove tree nectar has special properties. So whether they’re flower-fed in Pennsylvania or mangrove-fed in Madagascar, Swarmbustin’ Honey is helping keep these all-important bee populations healthy and thriving.